Look what happens when kids have plenty of books and spend plenty of time reading? Worldwide “book abundance” will be a real possibility in the next few years as we unite the availability of printed books with free, online libraries of digital books. Books are useless on the shelf. Voluminous libraries are only as valuable as the proportion of books they have flying off the shelves and into the hands of children and adults. The clearest indicator of a well-educated population is that its members continue to read and learn long after formal schooling is over. In this, we in the US are seriously lacking. Waiting until a child is entering Kindergarten to begin to nurture a love of reading and books is WAY too late. Parents, neighbors, and members of the community where children grow up are in the best position to be able to send children to their first day of school “hungry” to learn to read. The only individuals whom we really MUST get to care about reading are the kids themselves. Teaching for fluent reading is not enough. If young children don’t fully understand the power that comes from reading, all the excellent teaching in the world is doomed to fail. All children will learn to read proficiently only after they have developed a love of books and want to learn to read them well. Parents, neighbors, caregivers and educators can ensure that young children make this critical emotional connection. Having shared these observations, here’s a more scientific look at the current state of affairs where, in America, we seek to measure reading success solely by assessing proficiency, omitting that key emotional element that contributes to children growing into avid readers. This graphic doesn’t take much explanation. You will see its significance immediately. The National Assessment of Educational Progress (NAEP) measures reading achievement across our entire country by generating data from a sampling of schools. NAEP also assesses very important background variables for each child. 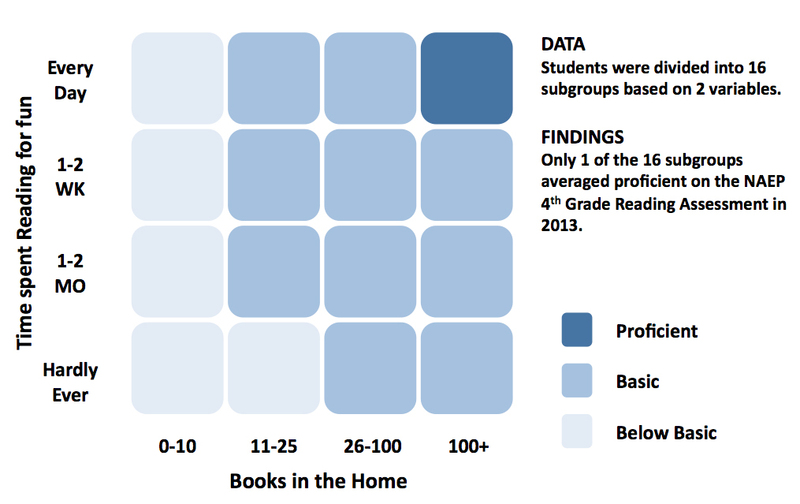 Given these data, what kind of policy and instructional changes might ensure that every child will end up in that dark blue cell where reading proficiency is the norm, and not the exception? * International Reading Association. (2014). Leisure reading [Position statement]. Newark, DE: Author. ← Are you Living in a Desert ? Good readers read. A lot. Yet we keep looking for the silver bullet method that’s going to make students learn syntax, vocabulary, strategies, and background knowledge instantly. So we have to be reminded that good readers read. I just finished a Time news article on page 20 of the July 7/14 issue about weight loss. The authors Park and Sifferlin reported that fat burners, appetite suppressants, fat blockers, and metabolism boosters are all either not scientifically shown to be effective or come with serious side effects. In health, education and other areas we need to come realize that quick fixes probably won’t work. You’re right, Glenn. The research is plentiful that if we get them joyfully reading, all of that, vocabulary, syntax, writing ability and the rest, will come so much more naturally and easily for the kids. It’s a focal shift from teaching to learning. I am presently directing our Summer Reading Program (aka “clinic” for students finishing their Masters of Literacy Education) at Penn State Harrisburg. A major emphasis this year is teaching the whole child (not just the part that “needs fixed”). It is so easy to focus on teaching skills and not recognize the affective dimensions of reading that impact whether instruction has an impact on student achievement. Thank you for this information…I will share it with my students tomorrow. Thanks for that, Deborah. I agree. Too often, despite our best efforts, the education we provide is some that is done TO the child rather than FOR the child. In many cases, affective aspects of learning are hard to measure. Not in reading, however, if we offer them the opportunity we can SEE kids choosing books they love and watch them choosing to read them for their own reasons. We just need to assess it consistently to bring it into consideration for data-driven instruction. I was observing in an “4th grade open classroom” in the early 70’s and one of the activities there was SSR, (Sustained Silent Reading). Essentially, every child chooses a book from the classroom library and then all are provided with time to read the book chosen. There were no restrictions regarding the books to be chosen. Of course, the teacher had the option of making suggestions to each child.. But, the key point was that time was provided for the children to read. The children also shared something about their book. I was impressed with the children’s selections and their interest in reading. They often read books that others described during the sharing time. It seemed to me that this activity had a positive effect on the children’s interest in reading! I was quite impressed! Thank you for illuminating the importance of affect in children’s literacy development. This point is grossly under-emphasized in schools and in teacher preparation. Students often miss out on pleasurable reading activities in the name of early intervention, usually via phonics instruction. The irony of this fact seems to escape many educators and administrators. These children are foreclosed from the one thing that can almost guarantee their success in school and in life. So many of my colleagues do not have a love of reading, or even a regular habit of reading. I wonder if this fact prevents them from seeing the importance of children feeling emotional engagement with books.